Contact Form online. It takes just 2 minutes and please opt in for all communications. putting the search word or phrase in the popup box at the top right. 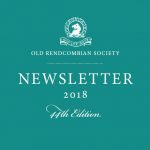 Old Rendcombian Society Newsletters (Click to open the Pdf document). Opens in a new tab 6Mb, 72pp. The document has bookmarks. Thanks to Bill White for supplying copies of the 1976 & 1977 editions and to Nigel Powell for the 1975 & 1978 editions.